Irish stout, chocolate and beetroot cakes with butter (unsalted), guinness, plain chocolate (70% cocoa), beetroot, cocoa powder, salt, unrefined dark muscovado sugar, unrefined light muscovado sugar, egg(s) (free range), coffee extract, self-raising white flour, butter (salted), cream cheese, vanilla extract, icing sugar. 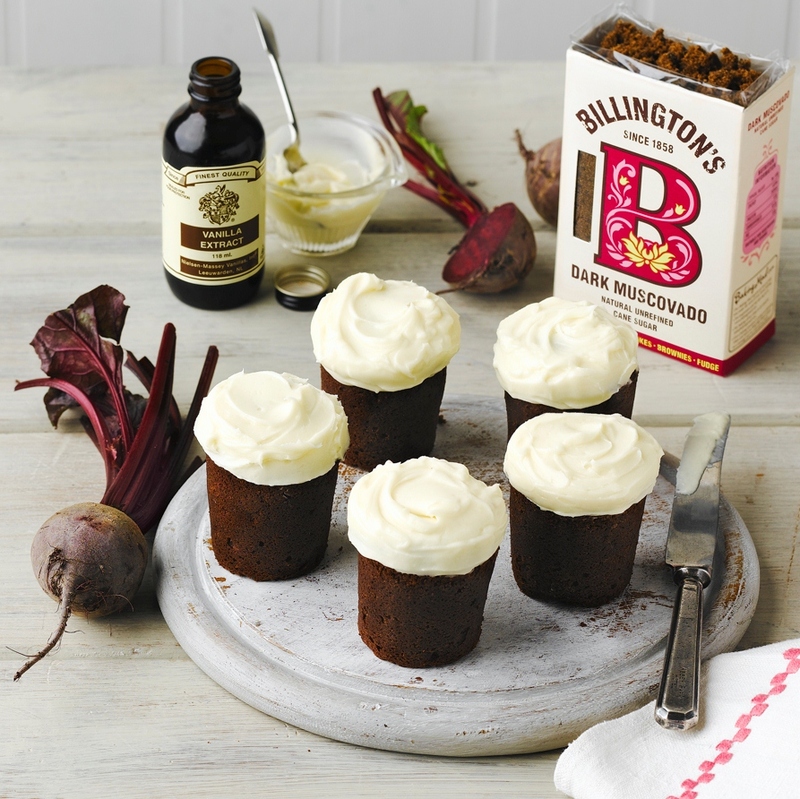 To make this irish stout, chocolate and beetroot cakes for 8 persons you will need 15 mins for preparation and 22 mins for baking. Step 1Preheat the oven to 180C (fan 160C, gas mark 4) and grease 8 dariole moulds (6.5cm x 6cm) with butter. Step 2Place the butter and Guinness in a saucepan and bring to a boil over a medium heat. Step 3Remove from the heat and stir in the chocolate until melted and put to one side to cool slightly. Step 4Place the beetroot into a food processor and whizz until finely chopped. Tip – to cook the beetroots, place whole and unpeeled in boiling water. Cook for 30 – 40 minutes depending on their size. Drain and cool under cold running water, then peel and trim them ready to use. Step 5In a mixing bowl, sift together the flour, cocoa powder and salt. Step 6In a large mixing bowl, using an electric mixer on high speed, beat together the sugars, eggs, and coffee extract for 3 – 4 minutes until the mixture leaves a trail when the beaters are pulled out. Step 7Reduce mixer speed to low, and beat in the melted chocolate mixture, followed by the beetroot until just combined. Step 8Using a large metal spoon fold in the flour mixture, until just mixed. Step 9Place in a jug and pour between the dariole moulds so that it comes no higher than 1.5cm from the top. Place on a baking sheet and bake for 20 minutes, a skewer should come out a little gooey when placed in the middle, don’t overcook them as they will continue to cook while cooling. Step 10Allow to cool for 15 minutes in the moulds and then remove from the moulds by running a knife around them and continue to cool on a wire rack. Step 11Make the icing by beating the ingredients together until smooth. Step 12Using a butter knife spread icing on top of the cakes to resemble the head of a pint.